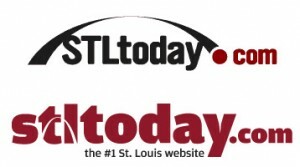 The St. Louis newspaper website has launched a new logo. I was never a fan of the old one, so this new one is an improvement in my mind. I would have used a different font though – similar but with less definition in the bottom of the “d” and “a” and the top of the “y”. Also, the arch cut into the “tl” is awfully thin and would all but disappear if the logo were to be any smaller.